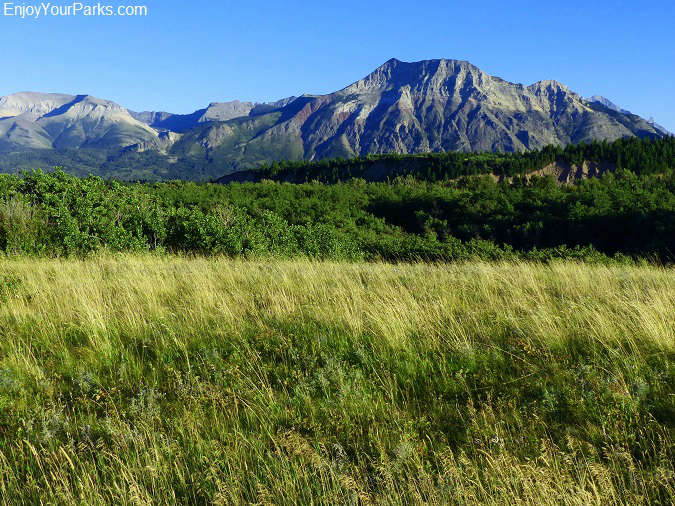 The Red Rock Parkway in Waterton Lakes National Park is a classic example of "where the mountains meet the prairie," and is one of only two paved parkways in the park (the other being Akamina Parkway). The entrance to the Red Rock Parkway is located on a Highway 5, about 1.7 miles north of the Waterton Lakes National Park Visitor Center or 2.6 miles from the Waterton Lakes Entrance Station. This two lane, narrow, windy, paved road is absolutely a joy to drive. The scenery is breathtaking, and there is wildlife throughout the parkway, including black bear, whitetail deer, mule deer, moose, bighorn sheep and much more. The Red Rock Parkway Road is 8.7 miles in length, and ends at the Red Rock Canyon parking area. 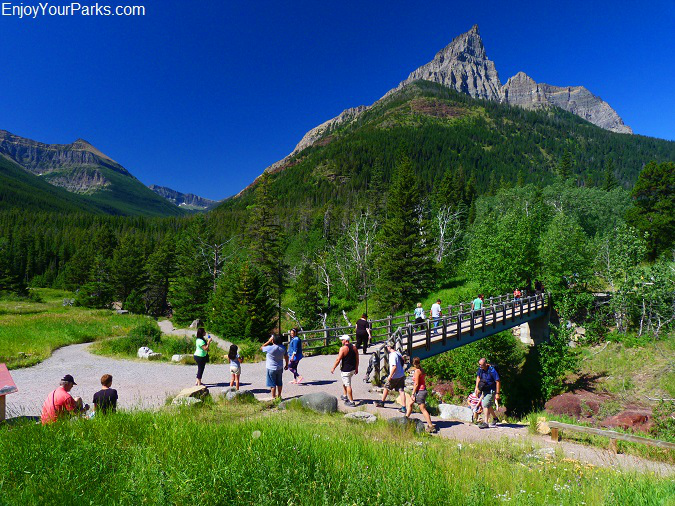 This incredible parkway is without question one of the most popular destinations in Waterton Lakes National Park, and is never a disappointment. We've driven this parkway hundreds of times, and we always see something we had never seen before! We never get tired of driving this amazing road, and either will you. 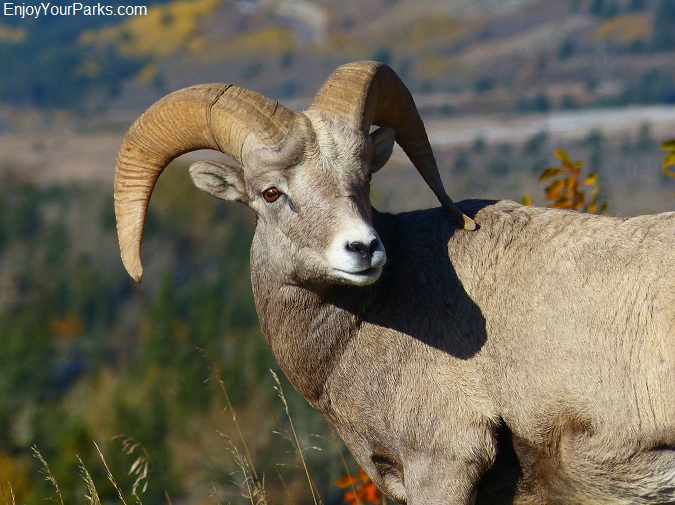 There are bighorn sheep found along the Red Rock Parkway in Waterton Lakes National Park. 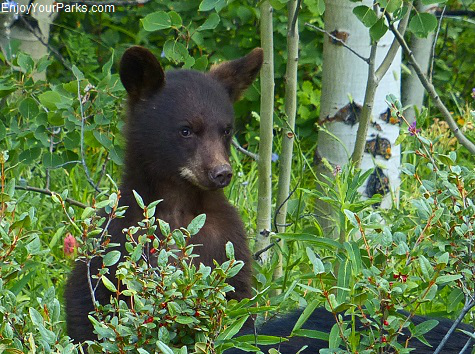 There are plenty of black bears along the Red Rock Parkway in Waterton Lakes National Park. 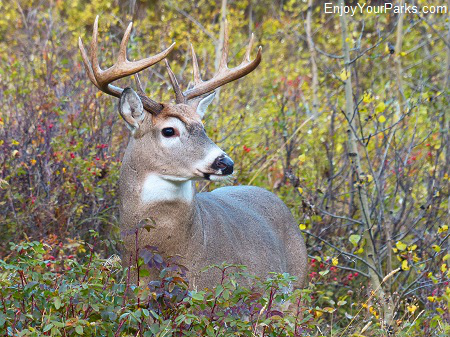 One of the main reason visitors enjoy driving along the Red Rock Parkway in Waterton Lakes National Park aside from the scenic beauty is the incredible wildlife that is found on or near the road. There are open slopes found on each side of the road in many places where wildlife love to hang out. And the most popular animal in the Red Rock Parkway is the black bear. Black bears frequent the Red Rock Parkway during the spring, summer and fall, and that is a major "lure" that bring visitors to the Red Rock Parkway. In addition to black bears, you have a good chance of seeing bighorn sheep, moose, whitetail deer, mule deer and elk. The best time to see these animals is early morning or late evening. 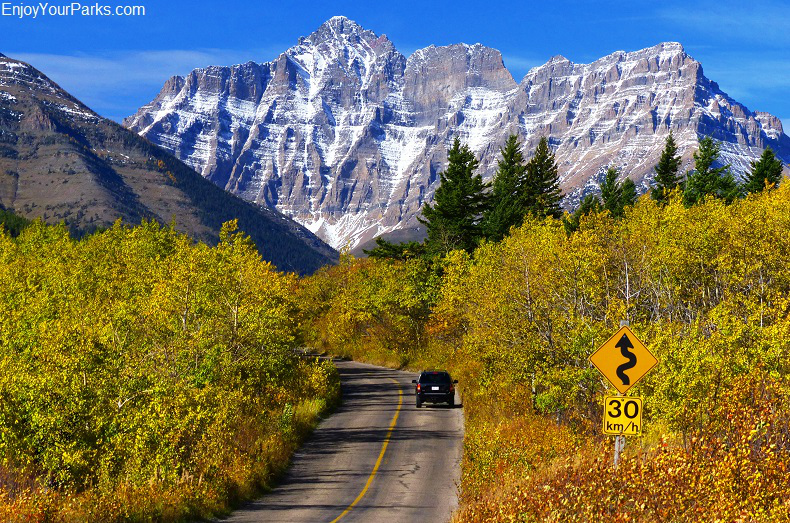 We highly recommend that you drive very slowly through the Red Rock Parkway in Waterton Lakes National Park for two reasons. 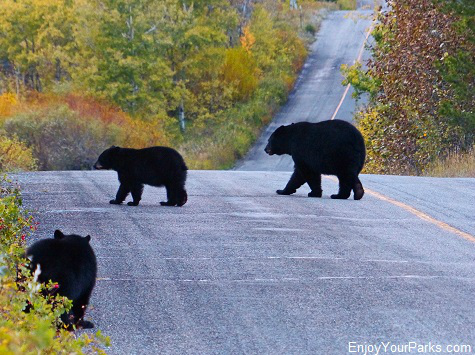 One reason is that if you drive slowly, you will increase your chances of seeing wildlife. The other reason to drive slowly is because there is a lot of wildlife that hang out right along the road, and sometimes on the road, and no one wants to see these animals get hit by a car. The Red Rock Parkway is very windy and very narrow with brush, bushes and trees right next to the road, so an animal can jump out at any time. If you're not driving slow, you will not have time to react. There are a lot of hills and blind corners where there is no way you could stop if an animal was in the wrong place at the wrong time, that is if you are driving too fast. So please, SLOW DOWN and enjoy the beauty of the Red Rock Parkway, and help save some animals. The Red Rock Parkway is a classic place "where the mountains meet the prairie." Whitetail deer along the Red Rock Parkway. 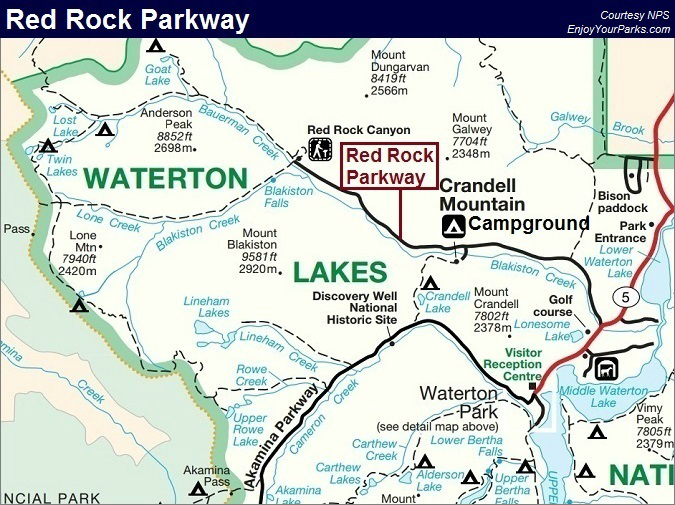 The Crandell Mountain Campground, located along the Red Rock Parkway, is one of three vehicle accessible campgrounds in Waterton Lakes National Park, the other two being the Belly River Campground and the Townsite Campground. 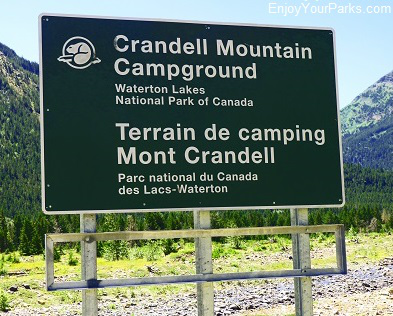 The Crandell Mountain Campground is nestled in a pleasant forested area, and has 129 unserviced sites. There are flush toilets, piped cold water and kitchen shelters. 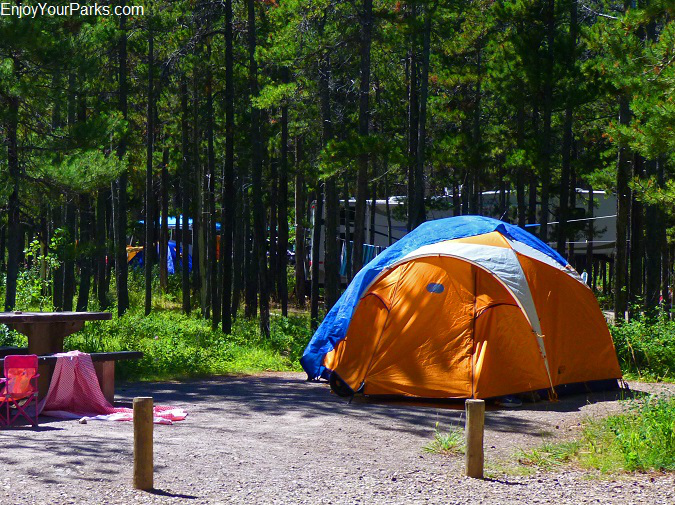 This campground is a very popular place for camping in Waterton Lakes National Park, and the campground is open from May 15 to September 1st, but these dates are of course weather dependent. 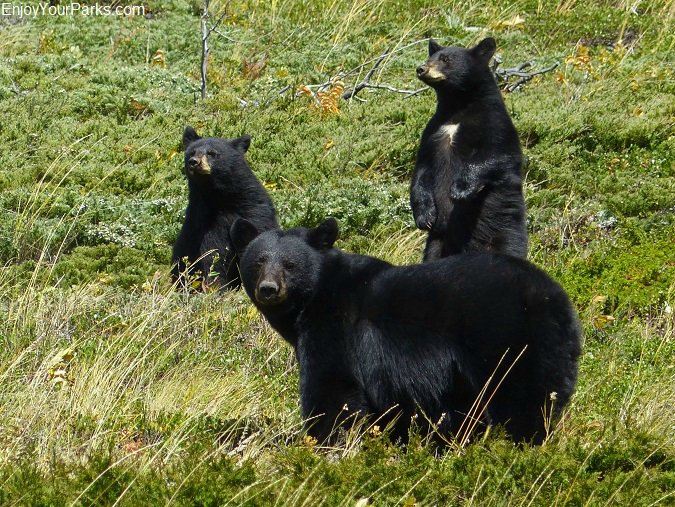 There are a lot of black bears that come through the Crandell Mountain Campground along the Red Rock Parkway in Waterton Lakes National Park, so please keep a clean camp. Do not leave any food out or anything that has food odors. Find out from rangers at the Visitor Center exactly how to leave your camp so it doesn't attract bears. Remember, "a fed bear is a dead bear." Campsite at the Crandell Mountain Campground along the Red Rock Parkway. The Crandell Lake Trail is a 1.2 mile hike (one way) with an elevation gain of 410 vertical feet. The Crandell Lake Trailhead is located near the Crandell Mountain Campground. To get there, take the road that heads for the campground from the parkway, and stay to the left as the road wraps around the entire campground. At the end of this road you will see the trailhead sign. Click Here for more details on the Crandell Lake Trail. The Blakiston Falls Trail is a short and easy 0.6 mile hike (one way) to the beautiful and popular Blakiston Falls. The trailhead to Blakiston Falls is located at the end of the Red Rock Parkway, at the large Red Rock Canyon parking lot. 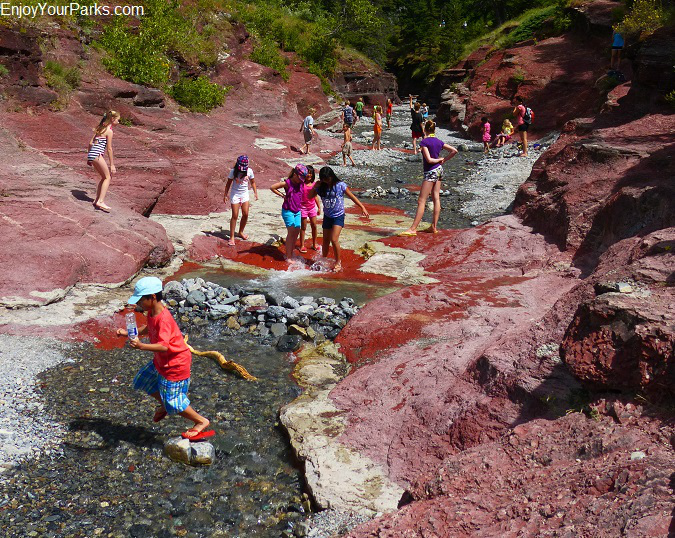 The Red Rock Canyon along the Red Rock Parkway in Waterton Lakes National Park is not only very scenic, but is a popular place for recreation among park visitors, especially during hot summer days! The Red Rock Parkway in Waterton Lakes National Park ends 8.7 miles west of the intersection at Highway 5, which is where the incredible Red Rock Canyon is located. This vivid red-colored canyon is not only fascinating and beautiful, but is a place for visitors to play in Red Rock Creek that runs through this amazing canyon. There is a large parking area with picnic tables and restrooms, which is a good thing because you'll want to spend some time exploring this wonderful area. Red Rock Canyon marks the end of the Red Rock Parkway in Waterton Lakes National Park. There is a nicely designed trail system that takes you along both sides of Red Rock Creek and Red Rock Canyon. There is a well-designed trail system that takes you along both sides of a portion of Red Rock Canyon. At the far north end of this trail system, you will encounter a bridge that takes you over a very deep and narrow section of this fascinating canyon. During the summer season, when the water is not very deep, you will see people walking up this stream bed and working their way even further north, deeper into this steep-walled gorge. The Red Rock Canyon gets extremely deep and narrow the further north you go. 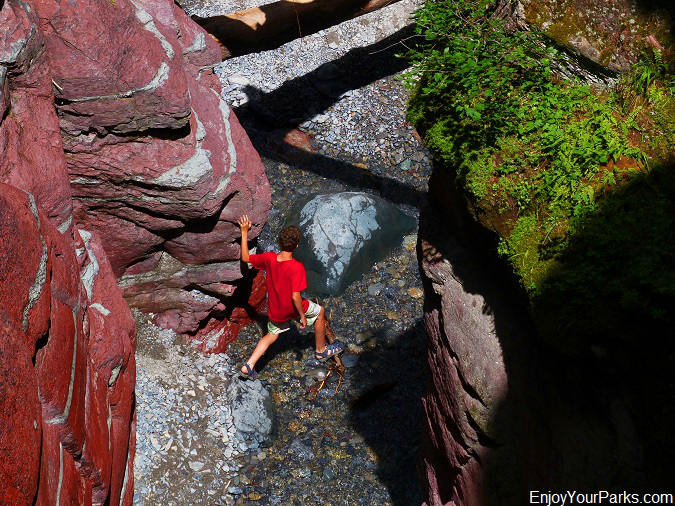 A popular activity is walking up Red Rock Creek into this deep and narrow canyon as far as you can go! Blakiston Falls is a popular destination for those visitors spending time at Red Rock Canyon, These falls are only 0.6 miles from the parking lot, and are well worth the effort to see. Located only 0.6 miles from the Red Rock Parkway parking lot, the hike to Blakiston Falls is a very easy and pleasant hike through a gorgeous forest. Blakiston Falls is extremely scenic no matter what time of year, but it is especially breathtaking early in the summer season when the snow is still melting and Blakiston Creek is still really rolling. There are two overlooks that you can enjoy once you get to these impressive falls. In addition to the Blakiston Valley Trail via Blakiston Falls, at the parking lot you will see a large foot bridge that crosses Red Rock Canyon, and serves as a gateway to several attractions to the west along the Snowshoe Trail. 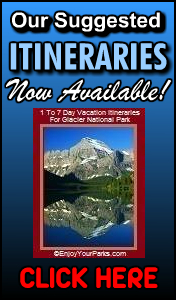 These attractions include Goat Lake, Avion Ridge, Blakiston Valley,Twin Lakes and more. 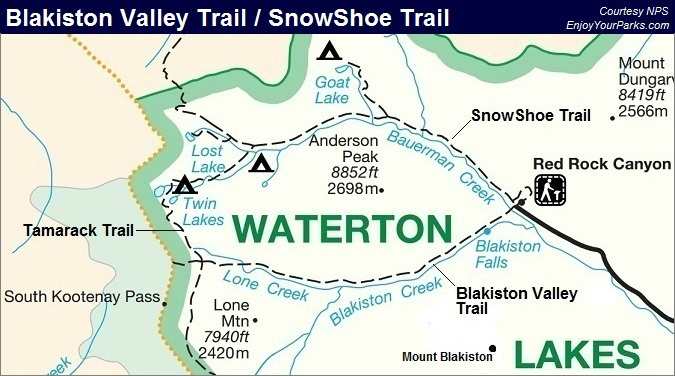 Many miles to the west, the Blakiston Valley Trail connects with the Snowshoe Trail, creating the Blakiston Valley-Snowshoe Trail Loop. This loop is a very popular longer day hike, which is 15.6 miles in length. 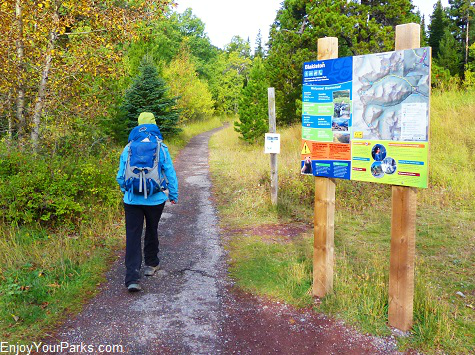 Description: The hike along the Blakistion Valley Trail takes you up the Blakistion Valley, and eventually you will connect with the Tamarack Trail in 6.3 miles. If you are wishing to continue on what is known as "The Blakiston Valley-Snowshoe Trail Loop", then take a right at this junction and hike along the Tamarack Trail for two miles until you encounter the Snowshoe Trail junction. Take a right here, and take the Snowshoe Trail for 7.2 miles until you reach the trailhead at the Red Rock Canyon Parking Lot. You can also reach the South Kootenay Pass by ignoring the Tamarack Trail and continuing on the Blakistion Trail for another mile. The Snowshoe Trail takes you up the Bauerman Creek Valley, where you have the option of taking the Goat Lake Trail beginning at mile 2.4, or continuing on to the Tamarack Trail Junction and Twin Lakes. If you are wishing to continue on what is known as "The Blakiston Valley-Snowshoe Trail Loop", at the Twin Lake Junction, continue on the Tamarack Trail for two miles until you reach the Blakiston Trail Junction. Take a left here and continue along the Blakiston Valley Trail until you reach the trailhead at the Red Rock Canyon Parking Lot. The hike to Blakiston Falls is the shortest (0.6 miles one way) and easiest of these hikes, and we highly recommend that you go take a look at these beautiful falls. If your up for a long day or multi-day hike, then you've definitely come to the right place as well, as the Blakiston Valley Trail and Snowshoe Trail await you! 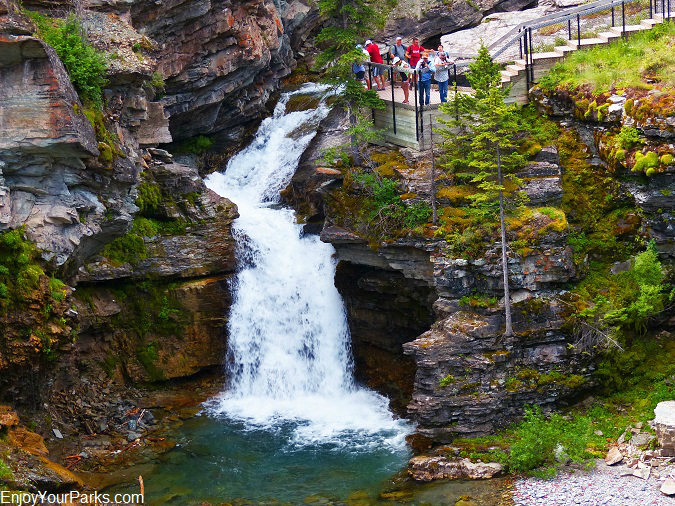 Without a doubt, no trip to Waterton Lakes National Park would be complete without driving up the Red Rock Parkway, and then spending some time exploring the Red Rock Canyon Area and Blakiston Falls. The Red Rock Parkway is definitely one of our "Top Ten Things To Do In Waterton Lakes National Park." 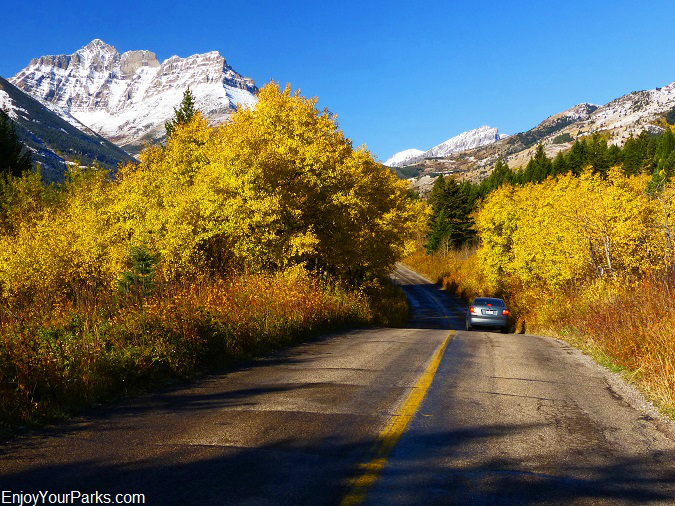 The Red Rock Parkway is one of our "Top Ten Things To Do In Waterton Lakes National Park with good reason... it's beautiful!